When I received the invitation for the family reunion to be held in Stanley, Idaho, I immediately began planning a side-trip to Idaho wine country. When my wine-loving Seattle sister and cousins from Oregon heard about the outing, they asked to join, and we had several fun-filled days tasting Idaho wine from 8 different wineries. You may be amazed to learn that Idaho now has 29 wineries and one AVA (American Viticulture Area) called the Snake River AVA. The majority of these wineries are located close Boise, though there are a few in Northern Idaho. See http://www.idahowines.org/ for a list of wineries and directions. Grapes were actually first planted here in 1862, but didn’t make it through Prohibition. The oldest and largest winery is St. Chapelle established in 1976, and when I reached out to my network, I was pleased to learn that the winemaker there was still Chuck Devlin whom I had met several years earlier at the West Coast Wine Competition. Chuck immediately responded to my email requesting a private tour and tasting, and he greeted us at the winery at 10:30am on July 30. With 4 adults and 4 kids we were rather a boisterous group, but Chuck was a wonderful host and welcomed us with his famous dry Riesling, which was one of my favorites. St. Chapelle and most of the other wineries of the Snake River AVA are about a 40 minute drive from Boise going East on 84 and then taking Exit 28 at Caldwell. The valley is beautiful with the Snake River flowing through the center, and surrounded by hills with vineyards and the larger Owyhee Mountains in the background. There is also a famous and distinctive rock outcropping known as Lizard Butte. St. Chapelle itself sits up on a hill overlooking the valley (http://www.stechapelle.com/). 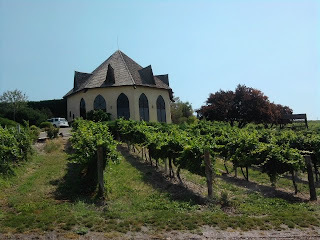 The architecture is designed to look like a chapel because the owners wanted to build a winery that reminded them of the famous chapel in Hermitage, France (see my earlier blog on visiting this area). Viticulture – Chuck took us into the vineyard and we saw that it and most of the other vineyards in the AVA are on 12 x 8 spacing, spur-pruned, and use sustainable farming with irrigation. He said the climate was primarily high desert with long hot sunny days in the summer and cool nights. It was 97 F degrees the day we visited. In most years they only receive around 11 inches of rain, so irrigation is necessary. The soil is very sandy and drains well. It used to be an old lake bed. Vines on southwest slopes with more afternoon sun exposure do best, as well as those that receive some wine. This helps the grapes ripen in time for the frosts of October, and the wind and dry weather also help to decrease threats of powdery mildew. Due to early frosts and snowy winters, they actually produce ice wine in Idaho! News to me! In terms of varietals, riesling seems to be one of the most prolific grapes and Idaho has gained some good press and following for their rieslings. At the same time, they seem to be growing many other types of varietals which traditional viticulture logic would NOT recommend growing together, such as merlot, cabernet sauvignon and malbec next to riesling and gewürztraminer, as well as Rhone varietals like syrah, roussanne and viognier. I also couldn’t get any clear answers on rootstocks and clones, and so I am assuming that they are in an experimental mode and trying to determine what will grow best here. Riesling is actually an interesting choice as the summers are quite hot in the Boise area – not at all like Riesling’s cooler mountain home in Germany. However, Idaho may be more similar to the Clare Valley of Australia with its hot days and cool nights; yet Idaho Rieslings do not have the distinctive lime character of Clare. It will be interesting to see how this grape plays out here -- as there are those who believe the climate is better suited to Rhone varietals. 2008 St. Chapelle Dry Riesling – very aromatic nose of roses and honeysuckle with peach and lime on the palate. Medium to long finish with refreshingly crisp acid. Delightful! 2007 St. Chapelle Merlot – medium bodied red with spicy nose/palate of plums and cloves. Aged half and half in used French and American oak for 6 months. 2008 St. Chapelle Cabernet Franc Late Harvest – a rare wine which is difficult to find (have only had one other from Canada) in a lovely pink color with sweet strawberry rhubarb nose/palate; viscous body; and great acid finish. R.S. around 18%. 2008 St. Chapelle Late Harvest Riesling –lovely golden yellow sweet wine with honey and apricot on nose and palate. Some kiwi on finish. Yum! R.S. around 18%. St. Chapelle also makes a sparkling Riesling, and has just introduced 3 semi-sweet wines they refer to as “soft.” There is a soft white, red, and rose, and they purposely leave residual sugar in the wine at around 6.5%. They created these wines in response to customer feedback and requests for sweeter wines – good for them! And guess what – the wines are flying off the shelf. Very popular. This is good, because St. Chapelle is quite a large winery at 150,000 cases made from over 600 acres of purchased grapes. They do not own any of their own vineyards. Winemaking - since they have won so many medals and awards for their rieslings, I asked Chuck to focus on winemaking for riesling only. They generally pick the grapes in early October at an ideal brix of 23.5 to 25 (of course, late harvest wines are picked at a much higher sugar level). Grapes are destemmed and then crushed in a large Bucher press. They are then cold-soaked for 24 hours with no settling enzymes. If not clear enough, he will use a centrifuge. Juice is transferred to large temperature controlled stainless tanks where Steinberg yeast is added. The dry Riesling generally takes around 3 weeks to finish fermentation at cool temperatures (55 – 65F), but the sweeter ones are stopped by adding a small amount of SO2 and filtering. Finished wine generally stays in the tank for at least a month and is protected with nitrogen gas. They have their own bottling line which processes 85 bottles per minute. Bottles sparged with nitrogen and more SO2 added before corking for a total of 30-35 ppm free. Interestingly Chuck mentioned that during the years in which he makes ice wine, he uses a continuous screw press to extract the small amounts of sweet juice from the frozen grapes. When asked about the temperature at which he harvests ice wine, he said that Idaho does not have a required F/C level such as the -8C in Canada and Germany. Altogether our visit to St. Chapelle was very enjoyable. We purchased about 2 cases of wine before we left, as well as some other goodies from the beautifully appointed tasting room. My sister and cousins were delighted with the visit.